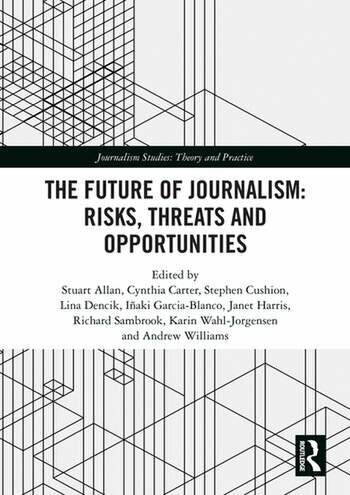 This volume draws together research originally presented at the 2015 Future of Journalism conference at Cardiff University, UK. The conference theme, ‘Risks, Threats and Opportunities,’ highlighted five areas of particular concern for discussion and debate. The first of these areas, ‘Journalism and Social Media’, explores how journalism and the role of the journalist are being redefined in the digital age of social networking, crowd-sourcing and ‘big data’, and how the influence of media like Twitter, Facebook, YouTube, Instagram, and Reddit affects the gathering, reporting or consumption of news? ‘Journalists at Risk’ assesses the key issues surrounding journalists’ safety and their right to report, as news organizations and their sources are increasingly targeted in war, conflict or crisis situations. The third area, ‘Journalism Under Surveillance’, asks what freedom of the press means in a post-Snowden climate. What are the new forms of censorship confronting journalism today, and what emergent tactics will help it to speak truth to power? ‘Journalism and the Fifth Estate’ examines the traditional ideals of the fourth estate, which risk looking outdated, if not obsolete, in the modern world. How much can we rely on citizen media to produce alternative forms of news reporting, and how can we reform mainstream media institutions to make them more open, transparent and accountable to the public? The final area, ‘Journalism’s Values’, asks how journalism’s ethical principles and moral standards are evolving in relation to the democratic cultures of communities locally, regionally, nationally or internationally. What are the implications of changing priorities for the education, training and employment of tomorrow’s journalists? Every chapter in this volume engages with a pressing issue for the future of journalism, offering an original, thought-provoking perspective intended to help facilitate further dialogue and debate. The chapters in this book were originally published in special issues of Digital Journalism, Journalism Practice, and Journalism Studies. The editors of this book are based in the School of Journalism, Media and Culture at Cardiff University, UK.